During recent decades we have witnessed a great development of bioinformatics that has led to the accumulation of a huge amount of biological information. 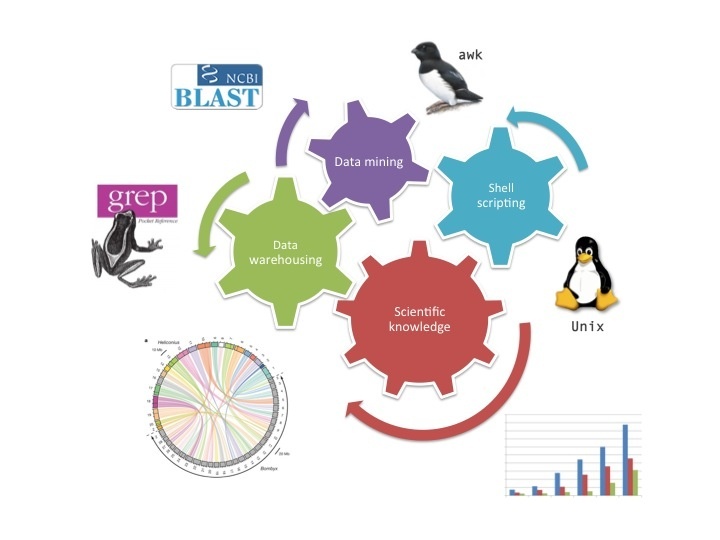 The Bioinformatics and computational Biology aim at dealing with this large volume of data so that biological information can be extracted, generating scientific knowledge. Handling and mining big data is currently a subject of great interest and importance. This course aim at familiarizing the attendees with the unix environment and shell scripting. The participants will develop and implement querying algorithms in order to generate metadata for analysis. This course can have recognition of 3 ECTs for FCUL PhD students enrolling in it as part of their first doctoral year. Minimal formation of students: bachelor degree in Biology, Biochemistry or related areas. Directed to: PhD or MSc students, postdocs, and professionals working in Molecular Biology, Biochemistry, Genetics and related topics. Unix command line, environment, settings, file system hierarchy, etc. Unix programming: shell scripting, arguments, status, variables, loops, etc. Fee: free for 1st year PhD students in the Doctoral program in Biology (FCUL), Biodiversity, Genetics and Evolution (BIODIV UL; UP) and Biology and Ecology of Global Changes (BEAG UL, UA) when the course counts credits for their formation, in which case the delivery of a final report done after the course is mandatory; 15 € for PhD students from institutions of the PEERS network (cE3c, CFE); 70 € for FCUL Master students and unemployed; 90 € for BTI, BI and other PhD students; 125 € for Professional and postdocs.